The first thing consumers see when our mailing arrives is our full-color wrap. This is the outer wrap into which all the other ads are inserted. Typically, 4 pages in size, multiple clients are able to purchase full or half-page ads in this highly effective piece. Due to its generous overall size ( Aprox. 10.5″ x 10.5″ ) your ad will have plenty of space for bold images and enticing offers. Printed in full color and delivered to an entire market, it provides a highly visible location for your advertisement. You can advertise on the Wrap for FREE! Who Should Consider Advertising on the Wrap? The wrap is a great option for businesses that pull from a broad area. Examples might be a multi-location franchise. If you have several stores in a market, the wrap will be your most cost-effective way to cover all your stores with one advertisement. Another great application for the wrap is if you are a business that travels to the customer’s location. 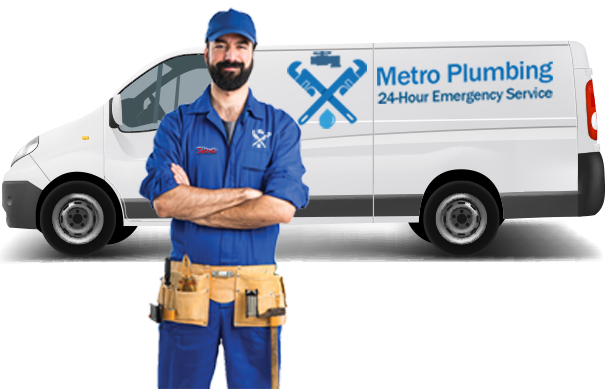 For example; a service provider like a remodeling contractor, or a landscaping company. Maybe you clean carpets or do mobile automotive repair. The wrap is good for you because it likely covers your existing service area in the most cost-effective manner, reaching all the potential prospects in the market. Are you a “Destination” Business”… A place where people come from miles around to visit? If so, the wrap is a great option for you due to its full market penetration and economical pricing. High consumer visibility. We are generally the biggest thing in their mailbox. Best value for your investment. Typically, the lowest cost per household reached. Turnkey product. 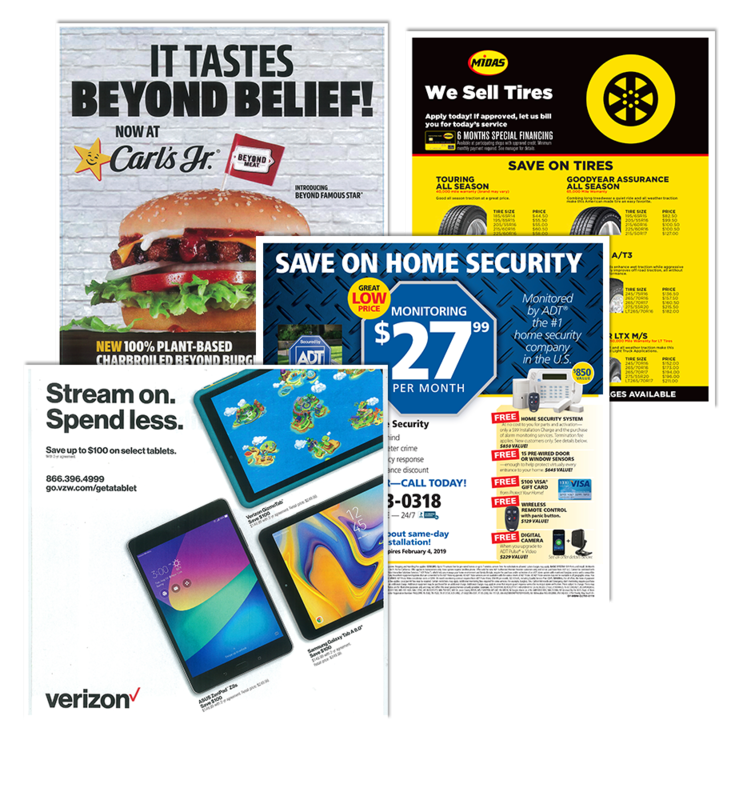 We design, print, and deliver your ad. Unmatched market reach. 99.8% of households in your market will receive your ad. Full-color glossy paper stock. Your ad will look great! Find Out More about Using the Wrap to Grow Your Business. Our “We Print Inserts” make it easy for you to mail professionally produced full-color inserts. With a variety of sizes and paper stocks to choose from, you decide which format best suits your needs and budget. Target your best responding areas by choosing individual zip codes for mailing. The value of using inserts to advertise your business are many: First of all, only your business is featured on the piece. 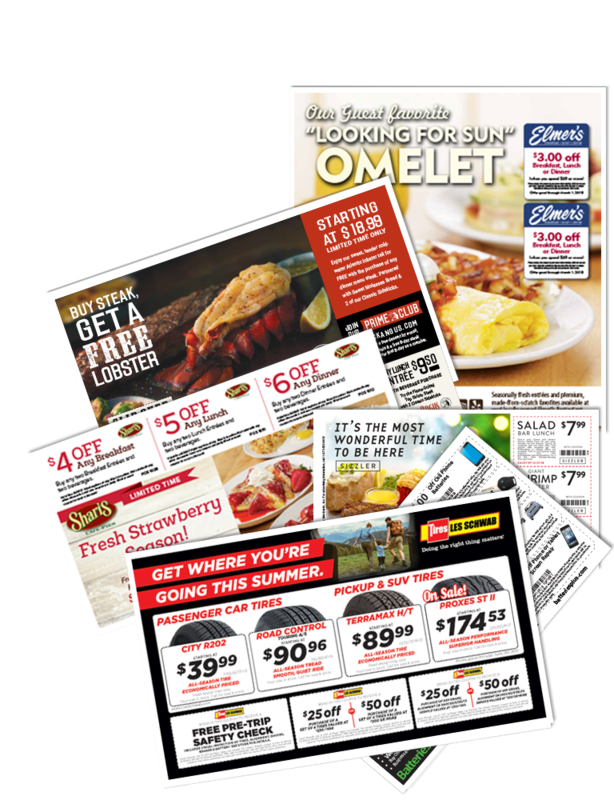 You get both sides to tell your story, present your products in full color, and extend offers and coupons to invite customers to your business. Additionally, your piece also stands alone making it convenient for consumers to take your insert with them when preparing to shop with you. But without a doubt, the most exciting feature is the ability to target where your inserts will go. You choose (with our expert assistance) where your inserts are to be delivered. We’ll provide you with detailed mapping and analytics to help determine the best responding zip codes for your specific business. We will then deliver your inserts to only those areas, saving you money and maximizing your ROI. 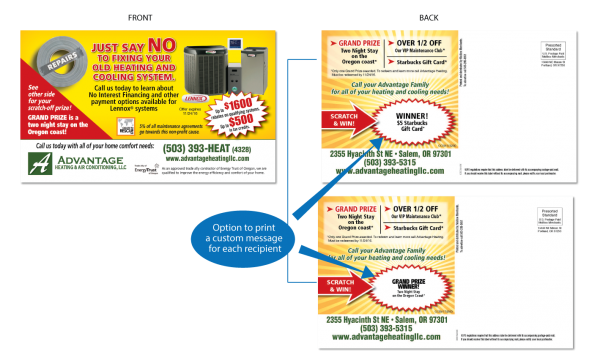 Who should consider advertising with We-Print inserts? We-Print inserts are a great option for small single location businesses. Because they typically only draw from a limited geography, the ability to target where you want to advertise is vital, both for response and affordability. Why waste dollars advertising to consumers that wouldn’t likely visit you anyway? A perfect example would be a local dry cleaner, or neighborhood restaurant. 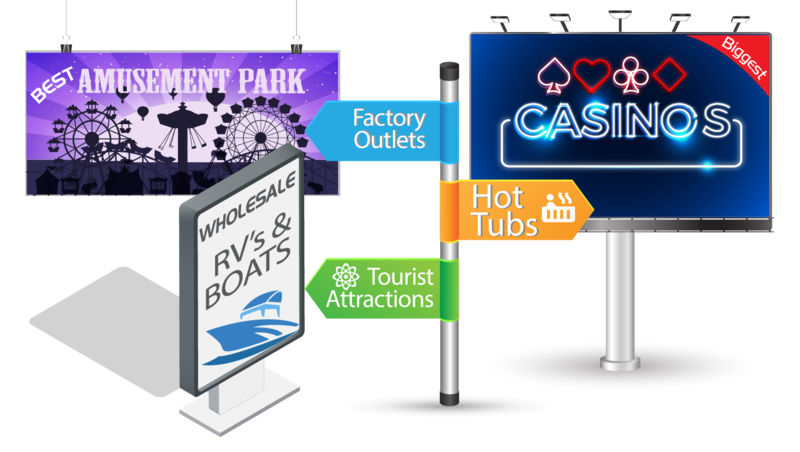 Since it’s unlikely that customers come from great distances to visit, you can focus your advertising in the immediate vicinity. Targeted we-print inserts allow you to do that. Larger business with multiple locations can also benefit by the targeted approach that inserts provide; just scale up the tactic. 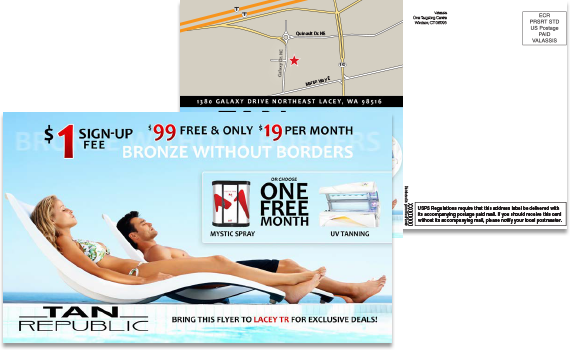 We can define unique marketing zones around each of your stores using our mapping and analytics tools and mail just to those zip codes. You can even send out different versions of your ad to different zips. Perfect for businesses that have different offerings at some of their locations. Multiple sizes and paper stocks. You choose what fits your image and budget. All ads printed in full-color. Your ad will look great! Targeted distribution. Mail only where your customers live. Great for small runs. As low as a 10,000 piece minimum on some products. Multiple versioning. Send different messaging to different parts of town. 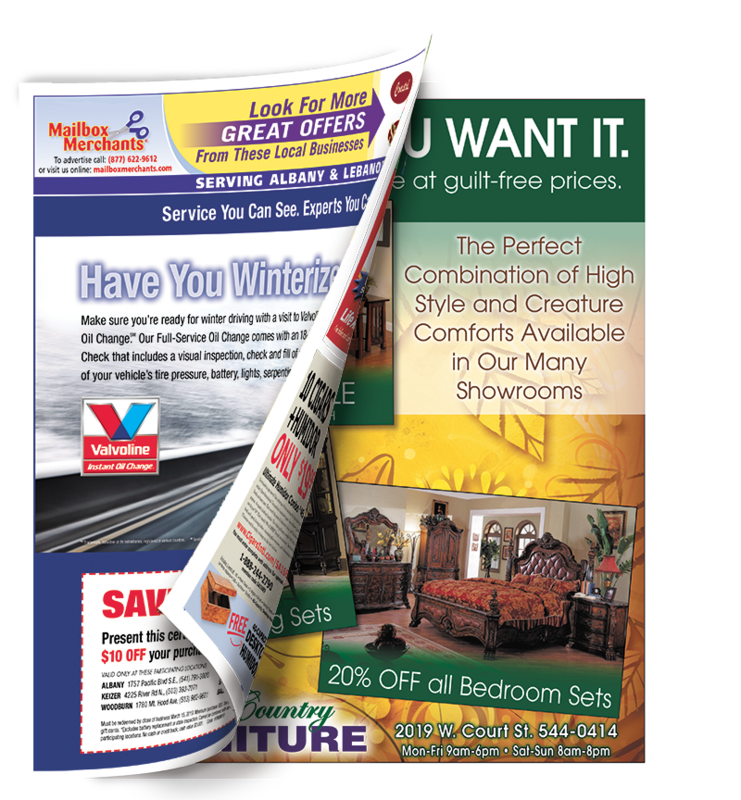 We’ll deliver your We-Print Insert for FREE! You send us your Insert, we’ll mail it for FREE! Many of our national or large franchise customers will choose to provide inserts to us already printed. They ship them directly to our production facility for targeted distribution. This is a great option for those clients that have the resources or have an opportunity to have their franchise print products for them. All the same distribution options available for our we-prints are offered for pre-printed inserts as well. Customer supplied inserts afford the client the opportunity to expand the level of creativity of their inserts, by utilizing different sizes, shapes, and materials for the advertising message. We distribute “Die-Cut” inserts that take on the various shapes of the products they are advertising. Some clients use envelope-based formats or oversized tabloids, while others send us coupon booklets or multi-page folded pieces. The choices are endless. Just be sure to check with us first to assure your insert is in a format we can distribute. Visit our Pre-Printed Inserts Specs page for more detailed information. Numerous sizes, paper stocks, and formats. You control the print costs. It’s easy to understand why the postcard is one of the most powerful forms of direct mail advertising. It’s highly visible, and you don’t have to open or unwrap anything to see what is being advertised. It’s tangible, it has a great shelf life, and it delivers your message quickly and clearly to anyone who sees it. We call our postcards Smart Cards for the simple reason that advertisers who use them and the cards themselves are really smart for a number of reasons. Smart Cards by Mailbox Merchants are delivered outside of our standard shared mail package. For this reason, they are perceived by consumers as a stand-alone piece of mail. But because the post office considers them to be a part of a shared mail package, you get the benefit of reduced postage costs just like the rest of our products. This results in a substantial cost saving over “not-so-smart” postcards. In many cases, our Smart Cards can be 1/3 less than the competition. Now that’s Smart! Our most popular and affordable Smart Card is our “Fixed” option. The “fixed” designation simply means that each recipient is receiving the same postcard with no unique customization. This card includes high impact 4-color graphics printed on both sides using a quality 9pt coated cardstock. Our low pricing always includes custom mapping of your target market, customer demographic information, free ad design, printing, and postage. No surprises! Our “Message” card takes the same features of our fixed product and adds an option to print a custom message for each recipient. This added message, printed in black only, can be a personalized greeting or a unique offering based on the occupant’s demographics. There is no end to the creative ways to utilize this capability. You can direct customers to your closest location or give them different phone numbers to call for tracking purposes. You can even vary the price points of a coupon based on whether they are an existing customer or not. Talk to us and we can brainstorm ideas together. We use the latest digital printing technology to produce our “Variable” Smart Card. This allows us to customize individual cards with appropriate imagery and messaging based on the recipient’s demographic information. 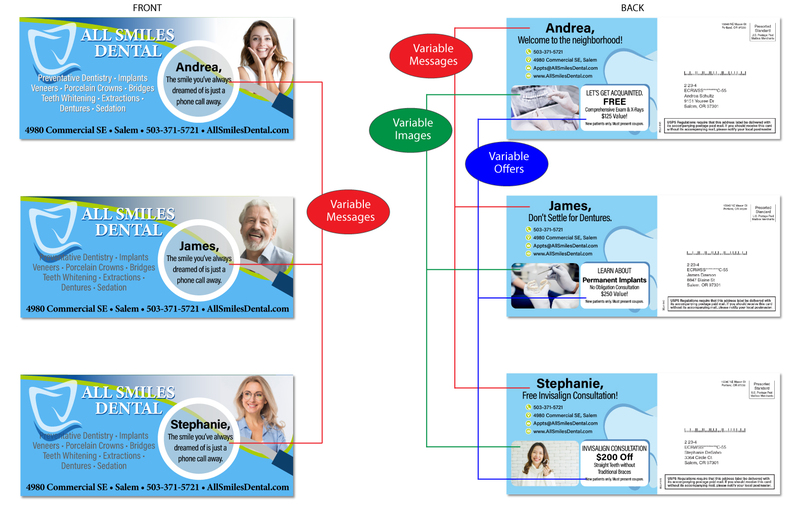 You can reach multiple customer segments at one time with one mailing. Imagine sending a card to seniors that will feature pictures they will relate to while sending different images and offers to young families. By using look-alike imaging and suitable messaging you increase response rates significantly and make your advertising more relevant to your prospective customers. One-to-one marketing increases your response and conversion rates exponentially. It’s a sophisticated technology that until now was incredibly expensive, but with our Variable Message Smart Card you have access to it at affordable rates. Stand-alone product. It mails outside of the package with the appearance of solo mail. Great value. Mail for a substantially lower cost than traditional mail. One-to-one messaging. Utilize variable messaging to impact different customer segments and increase ROI.